If Lech is one of my favourite places to ski, then it makes sense that Der Wolf is certainly one of my favourite places on the mountain to eat. 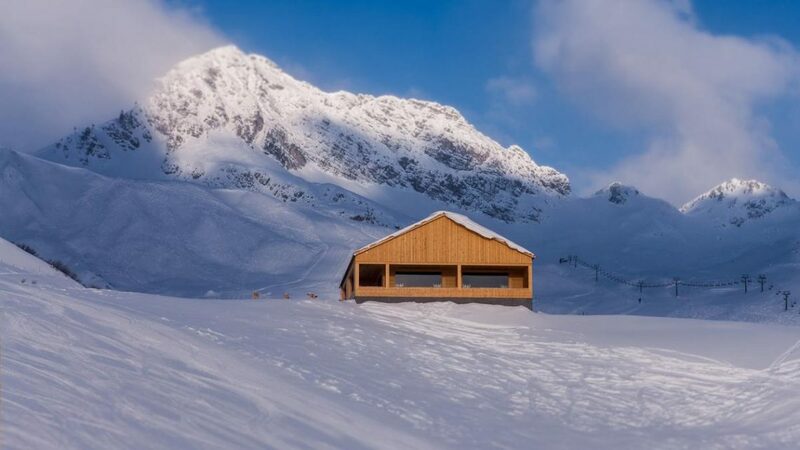 Christian Wolf the owner, built the mountain restaurant in the summer of 2016 with the help of the very talented architect Bernardo Bader. The design is somewhere between tradition and modernity using modern materials alongside untreated native spruce; the interior space is open and airy with fantastic panoramic windows looking out onto the mountains of Kriegerhorn, Omeshorn, Trittkopf and Rüfikopf; this is a space I could live in. The external terrace has been cleverly designed to give some shelter without taking anything away from the stunning views. Der Wolf is easily accessible from the top of the Petersbodenbahn and Weibermahdbahn chair lifts and pistes 200 Kriegeralpe and 210 Grubenalpe. 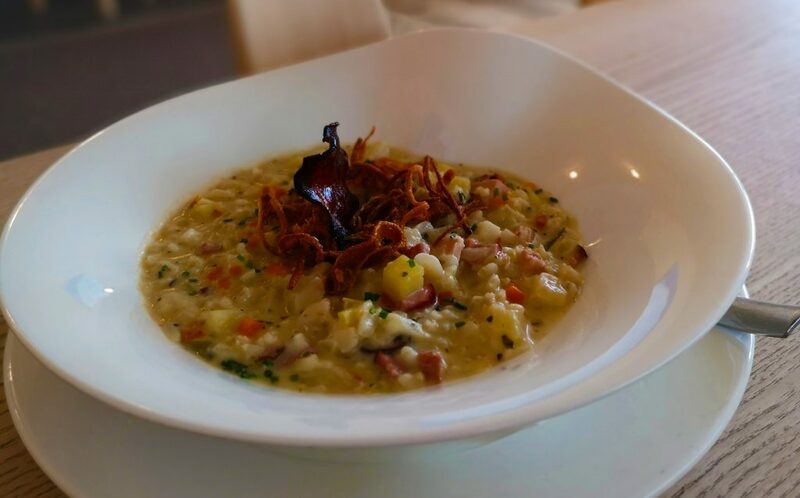 The menu is a mixture of local foods alongside international dishes, whilst the ingredients are sourced from the local Vorarlberg region where possible. We started our lunch with Limoncello spritzes, which were so good that we returned the next day to drink more of these refreshing delights. For first course Christian bought us their classic Cremige Erbsensuppe – creamy pea soup with sausage, this was a light, simple but delicious starter. For main course we opted for the Veganes Rotes Thai Curry – Vegan red thai curry with some chicken thrown in and the Alpler Eintopf – Alpine Hot pot with smoked pork, bacon, sausage, root vegetables and potatoes. 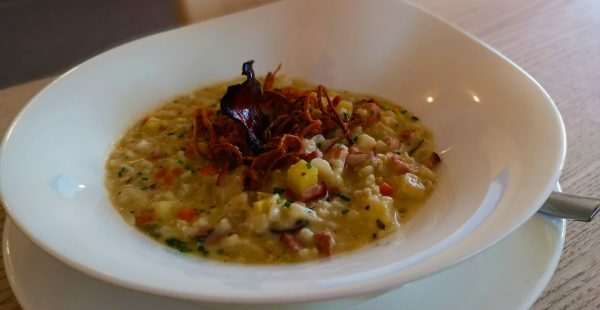 The Thai curry was fresh and natural tasting, and quite unusual to experience up on the mountain; the Alpine Hotpot was right up my street, with wholesome, smoky mountain flavours perfect for a cold winter’s day. Ask your waiter about wines that will compliment your food choices, as they have a great selection. Dessert was to be the Karamellisierter Topfen, Grießschmarrn – Caramelized curd cheese semolina pancakes. Normally in Austria, dessert means that one finishes the meal whole stone heavier and a little faster on ones skis, but this serving was the perfect size and surprisingly light in texture, especially when accompanied by their apple and pear schnapps. 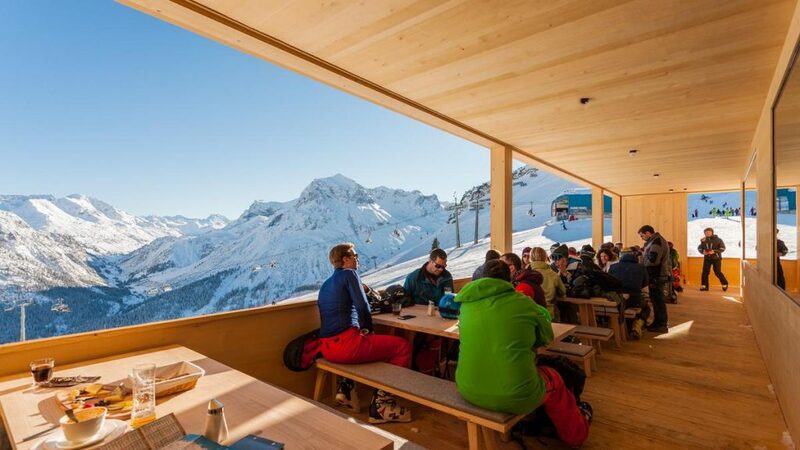 This is a mountain restaurant for all weathers, whether sitting out in the sun or hiding from Winter blizzards next to the log fire. We had a little tour behind the scenes, which explained a little behind this very slick run operation and why the food and drinks are so utterly delicious. 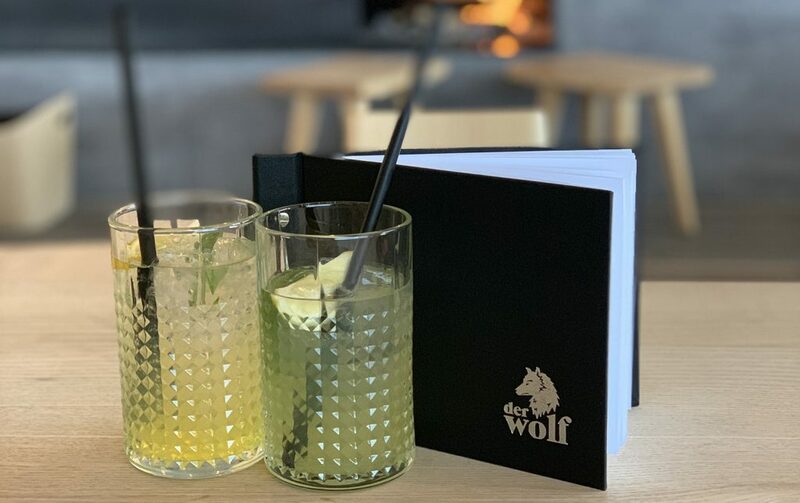 Make sure that on your next visit to Lech that you drop by Der Wolf for lunch, winter warming drinks, boozy drinks or even breakfast; If you go once, then I am sure that you will go a second, third, fourth time.